LIMA, Peru (CNS) — Berta Caceres remembers the day when she and other Lenca indigenous leaders were allowed to return to the Gualcarque River in Honduras, after a court had banned her from the area because she was leading a protest against a hydroelectric dam. Eight years after earth-moving equipment first rumbled into the Lenca community of Rio Blanco, sparking a protest that led to death threats against Caceres and other activists, the project has been suspended. But Honduras remains the country with the highest per-capita murder rate of environmental activists, according to a new report. Human rights workers and environmentalists hope a papal encyclical on climate and ecology, due out later this year, will give them much-needed support, said Jesuit Father Ismael Moreno, director of Radio Progreso and the Jesuit-run Team for Reflection, Research and Communication. Honduran environmentalists also got a boost April 20, when Caceres won the Goldman Environmental Prize, an international award given annually to grass-roots environmental activists from each continent. The $175,000 prize recognizes her leadership in opposing the Agua Zarca dam, a fight that has been marked by at least one murder and by death threats against Caceres — and more frightening, she said, against her children — as well as other indigenous leaders. Residents of Rio Blanco were unaware of plans for the dam until the bulldozers arrived, Caceres told Catholic News Service in a telephone interview. Honduras has signed an international treaty that calls for governments to consult indigenous communities before launching any projects that would affect their territories. With help from the national Council of Popular and Indigenous Organizations of Honduras, which Caceres helped found, the community waged what she calls a David-and-Goliath fight against the project. When appeals to government officials went unanswered, the residents sought international solidarity, which finally led to suspension of plans for the dams. But the fight is not over. A new plan would place a dam about a mile upstream from the original site, and the council has filed complaints in nearly 50 more cases in Lenca territory, she said. Father Moreno said, “For indigenous peoples, rivers are not only natural places — they are part of their tradition and their sacred relationship with the earth and their territory. “When (a) company starts to build (a) hydroelectric dam, it not only threatens people physically, but it also threatens their relationship with nature and the entire life of indigenous communities,” he said. Latin America is a dangerous place for environmentalists, according to a new report by the nonprofit group Global Witness. In 2014, 29 environmentalists were killed in Brazil, 25 in Colombia and 12 in Honduras, which has a population of only 8 million people. Other countries on the list were Peru with nine murders, Guatemala with five, Paraguay and Mexico with three each, and Ecuador and Costa Rica with one each. In Honduras, communities sometimes find themselves facing police and soldiers, as well as private security forces and death squads reminiscent of Central America’s civil wars, Caceres said. Besides the personal risk, communities face cultural and spiritual loss and the breakdown of families when they are forced off their land, Father Moreno said. “Families tend to move to large urban centers such as San Pedro Sula or Tegucigalpa. Some families say farewell to their children, because they migrate to the United States, while others go to work in assembly plants on the north coast of Honduras,” he said. While Caceres’ international award has shone a spotlight on the Lencas’ fight for land, other indigenous groups and small farming communities face similar problems, Father Moreno said. Pope Francis highlighted those threats in October, when he addressed the World Meeting of Popular Movements at the Vatican. Caceres attended as a delegate. Father Moreno said he hoped the encyclical will encourage bishops’ conferences to speak out more strongly against development plans that affect communities’ land and livelihoods. 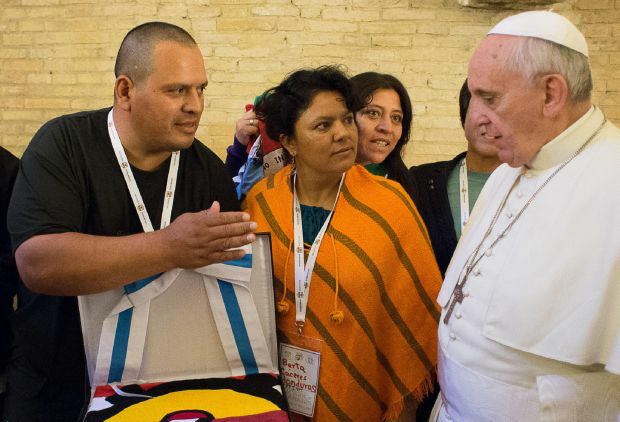 “The pope’s message is one of the greatest sources of support we can have for communities that are fighting for their land,” Father Moreno said.